On February 9, 2017, Natalie Silvanovich from Google Project Zero unrestricted access to P0's issue #983 , titled "Microsoft Edge: Use-after-free in TypedArray.sort", which got assigned CVE-2016-7288 and was patched as part of Microsoft security bulletin MS16-145  during December 2016. In this blog post we discuss how I managed to exploit this UAF issue to obtain remote code execution on MS Edge. 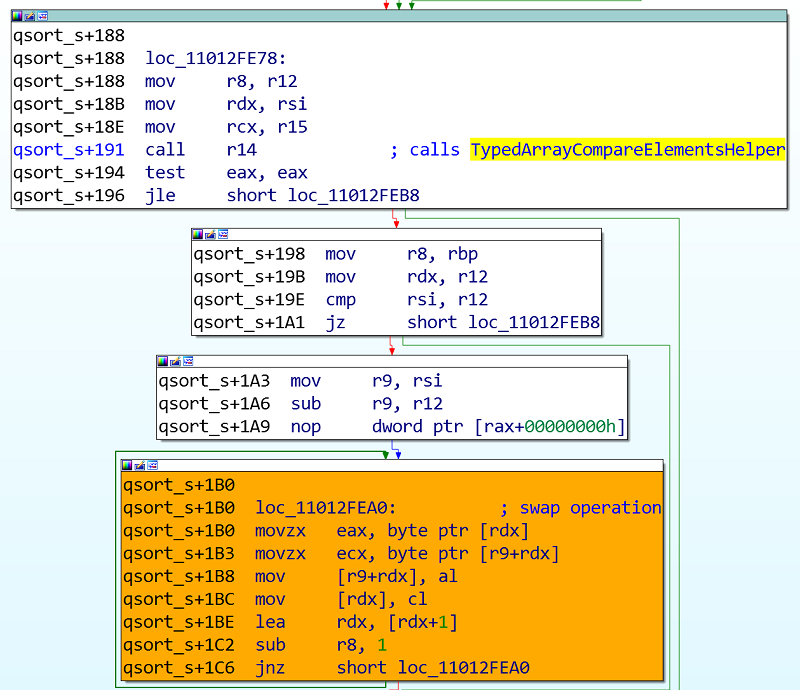 TL;DR: this article covers the root cause analysis of the CVE-2016-7288 UAF vulnerability affecting MS Edge, how to reliably trigger the use-after-free, how to influence Quicksort in order to control a swap operation and corrupt memory in a precise way, obtaining a relative memory read/write primitive and then turning it into an absolute R/W primitive with some help from WebGL, and finally bypassing Control Flow Guard using Counterfeit Object-Oriented Programming (COOP). It's worth noting that, in my tests, this PoC didn't trigger the vulnerability at all. I wasn't able to get a crash not even once, neither with our without page heap enabled. According to Mozilla's documentation for the TypedArray.sort method , "the sort() method sorts the elements of a typed array in place and returns the typed array". This method accepts an optional argument called compareFunction, which "specifies a function that defines the sort order". // We can always call qsort_s with the same arguments. If user compareFn is non-null, the callback will use it to do the comparison. The qsort_s function implements a quick-sort algorithm to sort an array of num elements [...] qsort_s overwrites this array with the sorted elements. The argument compare is a pointer to a user-supplied routine that compares two array elements and returns a value specifying their relationship. qsort_s calls the compare routine one or more times during the sort, passing pointers to two array elements on each call. All those details from the description of qsort_s will be very important for our task, as we'll see throughout this write-up. The CALL_FUNCTION macro will invoke our JS comparison function. Note that after invoking our JS function the code correctly checks if the typed array has been detached by the user-controlled JS code. But then, as explained by Natalie Silvanovich, "the return value from the function is converted to an integer, which can invoke valueOf. If this function detaches the TypedArray, one swap is performed on the buffer after it is freed". This element swap operation on a freed buffer happens within msvcrt!qsort_s after returning from TypedArrayCompareElementsHelper. This should be enough to trigger the bug. However, after running the PoC many times, I was surprised to see that it wasn't causing any crash on my vulnerable machine. 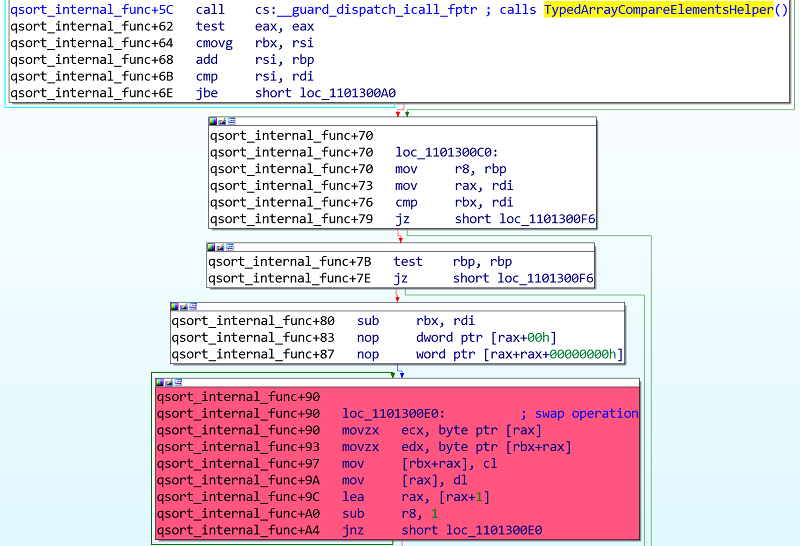 In the past I have written exploits for similar UAF vulnerabilities affecting Internet Explorer, also related to the detaching of the ArrayBuffer backing typed array objects at unexpected places. In my experience with IE, when neutering an ArrayBuffer via postMessage, the raw memory of the ArrayBuffer is freed immediately, so use-after-free conditions manifest instantly. After debugging the Edge content process for a while, I realized that the raw memory of the ArrayBuffer object was not being freed immediately but after a few seconds, in a way similar to a "deferred free". This caused the bug not to manifest, since the element swap operation within qsort_s didn't hit unmapped memory. The actual freeing of the raw memory of an ArrayBuffer happens within the following call stack. This doesn't happen instantly in the PoC provided by Project Zero; it's only triggered after all the JS code has finished running. So I needed to find a way to make the raw memory of the detached ArrayBuffer be freed almost immediately, before returning to qsort_s. I decided to try using a Web Worker, which I've already used in the past while exploiting a similar bug in Internet Explorer, plus waiting a couple of seconds, in order to give some time for the raw buffer to be effectively freed. //Force the underlying raw buffer to be freed before returning! 00007ff8`139000e0 0fb608          movzx   ecx,byte ptr [rax] ds:00000282`b790aff4=?? Use `!address 0000027aa4a4ffe8' to check validity of the address. Use `!address 0000027aa4dbffe8' to check validity of the address. So far we've got a typical UAF condition; at this point, after the free operation, we want to reclaim the freed memory and put some useful object there, before the freed buffer is accessed by qsort_s for the swap operation. This means that, unlike a lot of other UAF scenarios, we can choose in which heap our target buffer will be allocated: full pages managed by VirtualAlloc/VirtualFree, or the CRT heap in those cases where malloc is used as the allocator. That means that we can make it return true by specifying, for example, 0x10000 as the length of the ArrayBuffer we are creating. This way, the buffer that will be used-after-free will be allocated via VirtualAlloc. > bp kernelbase!VirtualAlloc "k 5;r @$t3=@rdx;gu;r @$t4=@rax;.printf \"Allocated 0x%x bytes @ address %p\\n\", @$t3, @$t4;gu;dqs @$t4 l4;gc"
At offset 0x8 of the Js::SparseArraySegment object we can see the reserved capacity of the integer array, with the elements of the array starting at offset 0x18. Since the UAF vulnerability allows us to swap two dwords when qsort_s decides to exchange the order of two elements, we'll try to take advantage of this to swap the array's reserved capacity with one of the array elements (which are fully controlled by us). If we manage to do that, we'll be able to read and write memory outside the limits of the array. By the way, my reclaim function (which is called after detaching the ArrayBuffer and before returning from v()) looks like this. Note that I'm subtracting 0x38 (offset of the array elements from the beginning of the buffer) from the 0x10000 size and then dividing it by 4 (size of each element), so allocation size is exactly 0x10000. This spray has the additional property that the allocated block are adjacent to each other with no gaps in between, which will be helpful later. Interestingly, if for some reason you were thinking about spraying blocks bigger than 0x10000 while still complying with the IsValidVirtualBufferLength checks, you'll soon notice how slow the quicksort algorithm can be when operating on arrays with a lot of repeated elements  :) So it's definitely better to stick with 0x10000, which is the minimum length for which IsValidVirtualBufferLength will return true, unless you want your exploit to run for minutes. You can see the value 0x9 at offset 0x28, and the value 0x55555555 at offset 0x4c. The value 0x66666666 can also be seen at offset 0x80, but it's not relevant now; it was there to influence the quicksort algorithm and cause the precise swap we need. Awesome! :) One of our sprayed integer arrays is now occupying the memory previously occupied by the raw buffer of the ArrayBuffer object. The swap code of qsort_s will now exchange the dword at offset 0x28 (before UAF: value 0x9, now: capacity of the int array) with the dword at offset 0x4c (before UAF: array element with value 0x55555555, now: array element with value 0x7fffffff). 00000235`48070028  7fffffff         // <--- we've overwritten the array capacity with a big value! Since we've overwritten the original capacity of the array with an arbitrary value of 0x7fffffff, now we can take advantage of this corrupted int array to read and write memory outside its bounds. Being the array capacity a 32-bit integer, we won't be able to address the whole 64-bit address space of the Edge process; instead, we'll be able to address up to 4 Gb of memory, starting from the base address of this int array. Also, having control over a 32-bit index while the target address is calculated as a 64-bit pointer, we'll only be able to access memory addresses greater than the base address of our corrupted int array; it's not possible to address lower ones. Finally, this is a relative memory R/W primitive. We cannot specify the absolute address we want to read from/write to; instead, we specify an offset from the base address of our corrupted int array. Finding the corrupted integer array which will provide us with the R/W primitive is really easy. We just need to traverse all the sprayed int arrays, looking for the one whose element at index 5 has a value different than 0x41414141 (remember that during the swap operation the original array capacity is written to the position where the element with index 5 is located). Also, you should always keep in mind that doing an OOB read from an arbitrary index N requires a previous write to index >= N.
Under an ideal scenario with a fully arbitrary R/W primitive, after leaking a pointer to some object, we would just need to read the first qword at the leaked address to obtain the pointer to its vtable, thus being able to calculate the base address of a module. But in this case, we have a relative R/W primitive. Since the R/W primitive is achieved by using an index into an array, the target address is calculated like this: target_addr = array_base_addr + index * sizeof(int). We have full control over the index, but the problem is that we have no clue about what our own array base address is. Being a bit blocked about how to overcome this problem (not knowing the base address of my own corrupted array), I decided to experiment with technologies which could allocate buffers using VirtualAlloc, like asm.js and WebGL, looking for something useful for the exploit. I decided to log allocations performed via VirtualAlloc while loading a web page with a 3D game engine ported to JS, and I saw that some of the WebGL buffers contained self-references, that is, pointers to the buffer itself. So at that point my next steps became clearer: I want to free some of the sprayed arrays, creating memory gaps, and try to fill those memory holes with WebGL buffers, hopefully containing self-reference pointers. If that happens, it's possible to use our limited R/W primitive to read one of those WebGL self-referencing pointers, thus disclosing the address of one of our (now freed and occupied by WebGL) sprayed int arrays. 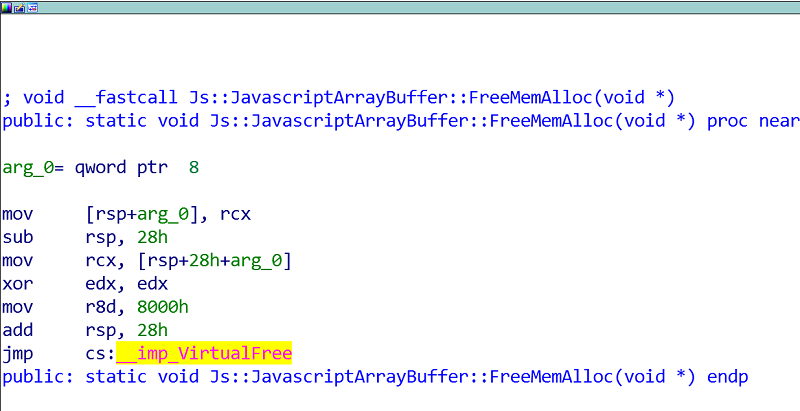 While freeing some int arrays to make space for the WebGL buffers I noticed that they're not instantly freed - instead, VirtualFree is called on them when the thread is idle, as suggested by the following call stack (notice the involved method names like Memory::IdleDecommitPageAllocator::IdleDecommit, ThreadServiceWrapperBase::IdleCollect, etc.). This can be overcome by scheduling a function to be executed a few seconds later via setTimeout. > bp kernelbase!VirtualFree "k 10; gc"
After several tests related to WebGL, I saw that the WebGL-related allocation that I could trigger the most reliably to reclaim the memory hole left by my freed int arrays was the one with the following call stack. Curiously this allocation is not done via VirtualAlloc, but via HeapAlloc, yet it lands on one of the memory holes I have left for this purpose. //Read the address of the vtable! So if we are lucky in that the address of the leaked object is greater than the address of our corrupted int array (if we're not lucky in the first try we'll need to work a bit more), we can trivially calculate the proper index to target the address of the object for an OOB read, so we obtain the pointer to the vtable and then we can calculate the base address of chakra.dll. This way we defeat ASLR so can move on to the next step in our exploitation process. Now that we can read and write to the object we've leaked, we want to bypass Control Flow Guard so we can redirect the execution flow to our ROP chain. In order to bypass CFG I used a technique known as Counterfeit Object-Oriented Programming (COOP)  or Object Oriented Exploitation . The first function (a COOP gadget) passes the address of a local variable (located on the stack) as an argument for another function, which is called through an indirect call. The second function expects one of its arguments to be a pointer to a structure, and writes to a member of that expected structure. Given a second COOP gadget writing to the proper offset within the expected structure (equal to address where the return address for the first function is stored in the stack minus address of local variable passed as argument from the first function), it's possible to make the second function overwrite the return address of the first function in the stack. This way we can divert the execution flow to our ROP chain when the RET instruction of the first COOP gadget is executed, while circumventing CFG, since this mitigation does not protect return addresses. In order to find the two needed functions satisfying the conditions explained above, I wrote an IDApython script based on the awesome taint engine of Quarkslab's Triton  DBA framework, which is developed by my colleagues Jonathan Salwan, Pierrick Brunet and Romain Thomas. As can be seen in the disassembly of the CRTCMediaStreamTrackStats::WriteSnapshotForTelemetry function, the qword used to overwrite the return address comes from RCX+0x40 / RCX+0x44, which means that it is a member of the object with a fake vtable, therefore it is fully controlled by the attacker. When exiting the first COOP function the overwritten return address is taken, so at that point we have bypassed Control Flow Guard. We use the address of a stack pivoting gadget as the value that will overwrite the return address; this way we just start a traditional ROP chain that invokes EShims!NS_ACGLockdownTelemetry::APIHook_VirtualProtect to give executable permission to our shellcode, obtaining this way remote code execution. ArrayBuffer objects have been the source of a good number of use-after-free vulnerabilities accross different web browsers, and the Chakra engine in Edge is no exception. The fact that the ArrayBuffer constructor can use two different allocators (malloc or VirtualAlloc), plus the fact that we can control which one is used based on the length of the ArrayBuffer to be created, brings in more possibilities to explore while trying to exploit the vulnerability. It would have been probably harder if our only option was to allocate the underlying buffer on the CRT heap. Obtaining the base address of the corrupted integer array in order to turn the relative R/W primitive into an absolute R/W one took quite an effort. Figuring out how to abuse Quicksort to do the precise element swap I needed was hard too. Finally, the last section of this blog post shows a practical application of Counterfeit Object-Oriented Programming (COOP), in which we managed to bypass Control Flow Guard by leveraging two valid C++ virtual functions: chakra!Js::DynamicObjectEnumerator<int, 1, 1, 1>::MoveNext and edgehtml!CRTCMediaStreamTrackStats::WriteSnapshotForTelemetry. They can be chained to overwrite the return address of the former, thus bypassing CFG. I'd like to thank my colleagues Sébastien Renaud and Jean-Baptiste Bédrune for reviewing this article.